IAYP awards were given in an awe inspiring programme on 17th April 2016 in the Assembly Hall. The Chief Guest on this occasion was former Principal, Mr N K Tewari. Mr Tewari was a keen participant of adventure activities during his tenure as the Principal of The Scindia School. The ceremony began with a melodious instrumental music performance by the school Orchestra. Then Pawan Jaini welcomed the gathering and briefed them about the history of the awards. He said that the International Award was founded by HRH The Duke of Edinburgh in 1956, in conjunction with Kurt Hahn, the German educationalist. Both of them resolved to create a programme that would be a “do-it-yourself kit in the art of civilised living”. This International Award is an exciting self-development programme available to all 14 to 25 year olds. In this programme the young people design their own Award Programme, set their own goals, and record their own progress. Then Pawan Jaini read out the detailed report on various adventure activities that were conducted throughout the year. Soon after this Mriganka Ghosh announced the awards. 58 students got Bronze, 16 got Silver awards and 11 students got Gold. The cycling team was also felicitated on this occasion. 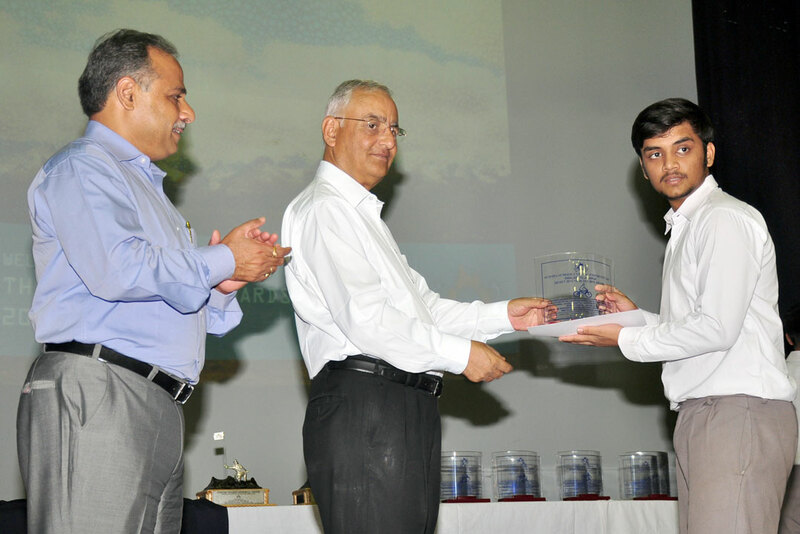 The Chief Guest, Mr N K Tewari gave away the awards to the meritorious students. It was followed by the announcement of Anirudha Sharma Memorial Trophy which was given to Sukanya Shukla and Ankit Mehrotra by the Principal, Dr Madhav Deo Saraswat. It included a certificate, the award and a blazer. This award recognised the spirit of adventure amongst them and their achievements were read out. At the end the Chief Guest, Mr N K Tewari congratulated the winners. Mr Tewari recalled the days when everyday was an adventure. And how the activity began on a very small scale and soon many joined in. Mr Tewari spoke glowingly about Mr Anirudh Sharma and Mr Alok Virmani whose dedication towards adventure at a time when adventure was unthinkable, inspired many more in the years to come. The scenario changed over a period of time and the boys went on expeditions to various peaks. Mr Tewari also valued the contribution of Mrs Raksha Siriah and Mr Dhirendra Sharma in instilling the spirit of adventure among the young and daring Scindians. He recalled the large number of people who richly contributed to the cause. Mr Tewari reinstated the values of Service, Skill and Physical Fitness which are considered pillars of IAYP. Finally the much awaited part of the programme came when a video was shown which featured adventure activities that were conducted throughout the year. To conclude some information was given about upcoming programmes and some prospective events which are scheduled in the summer break. At the end of the programme all the boys felt exceptionally motivated.